Easy and familiar Verifone interface. Super Fast Transactions! 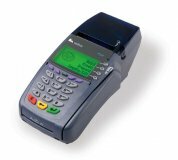 Designed with small footprint for easy handling, VX510 combines mag-stripe card reader, high-speed thermal printer with drop-in paper loading, and internal PIN pad with user-friendly ATM-style interface to minimize costly errors. 6MB Memory means you can expand this terminal in the future with ability to take custom card types, gift cards, loyalty cards, your own company revolving credit cards, etc., which the 510LE does not. For maximum power and flexibility, the VX570 model would be suitable, which replaced the 3750.